A man is lying on the ground inside a half-zipped body bag, his frail arms laid over his chest, his head leaning on its side. Body Team 12, one of the many body teams working to collect victims in Liberia during the Ebola crisis, stands several feet away. Only one member approaches at first, Garmai Sumo, the only female member of the team. Wearing head-to-toe white plastic, thick goggles and bright yellow rubber gloves, Garmai walks toward the body fearlessly, like she's done this dozens of times before, which she has. She then kneels down near the young man and inserts a cotton swab into his mouth in order to collect a sample. She's calm, focused. Once the sample is collected quickly and carefully, she swiftly steps away and returns to her team. "The role of the woman on the body team is one of strength and support and a really nurturing presence," says Olivia Wilde, executive producer of Body Team 12, winner of Tribeca Film Festival's 'Best Documentary Short,' "not only for the families that they are collecting the bodies from, but also for her fellow team members." When Garmai talks about her job in Body Team 12, produced by RYOT News, she smiles proudly. She has arguably the most terrifying job in the world, and yet she doesn't seem scared. Each day she faces extreme danger, not only from the disease itself, but from confused and enraged family members, who don't understand why Garmai and her team must take their loved ones, and why they can't give them a proper burial. In one scene, Garmai reasons with a group of men who are threatening to set her jeep on fire. "It really opened my eyes," director David Darg says of the filming experience. "Imagine having to do that day in, day out, month after month, not only removing bodies and seeing horrific things, but being met with threats of violence on a daily basis." Not only does Garmai, and every other body team member, risk physical harm, they also risk being isolated from their friends and families. "There was such a high anxiety in the country," Darg says. People that were known to be working in close quarters with Ebola victims and patients were particularly ostracized and feared by their community, so Garmai and her son really lost a lot of family and neighbors during the outbreak. Thankfully, Garmai still had her son, who never neglected to appreciate the impact she was making. 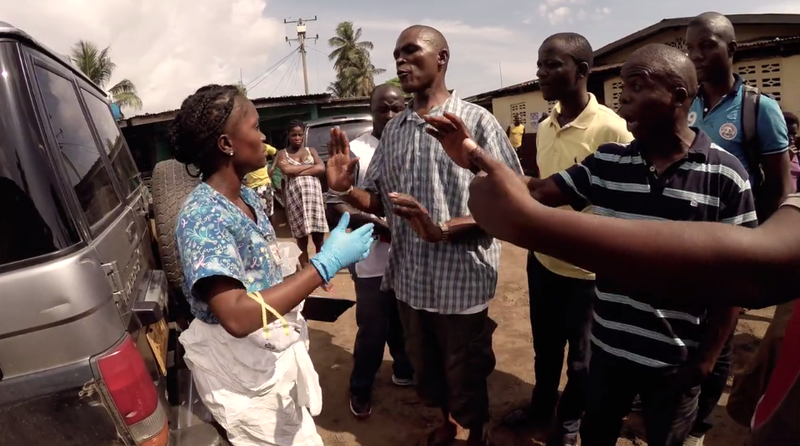 When she would return from a day on the ground, after delivering victims bodies to be cremated, her son would rush into her open arms, exclaiming "Ebola hero!" "I feel like Garmai is a feminist hero," Wilde says. "She is an example of both being incredibly powerful and capable in her own right, but also embracing her feminine role as the nurturer." 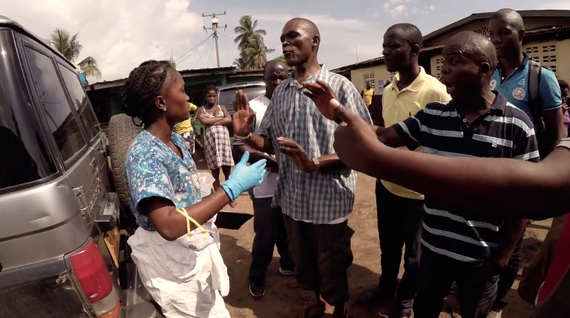 Thankfully, since the Ebola epidemic has subsided, with the World Health Organization declaring Liberia free of Ebola this month, Garmai is able to reunite with a lot of old friends and family members. "A lot of relationship healing is going on for sure," Darg says. Garmai is no longer collecting bodies, but working with Darg to care for more than 170 children who lost their parents to Ebola. "It's really kind of the most extraordinary part of the story," says producer Bryn Mooser. "She was meeting these children at their darkest hour, at their most vulnerable. We're very proud that she can now be out of that high-stress role, and focus on really helping to take care of those that were left behind." Since every RYOT film aims to provide a way for the viewer to take action, they are encouraging people to support Garmai's cause through the Ebola Orphan Project, providing education and food for children left behind after the epidemic. "We wanted to tell this story because we wanted it to be a tribute to Garmai's bravery and the bravery of her teammates," Darg says, "and all the Liberians who risked everything for their countrymen, for their children, and for the world at large."